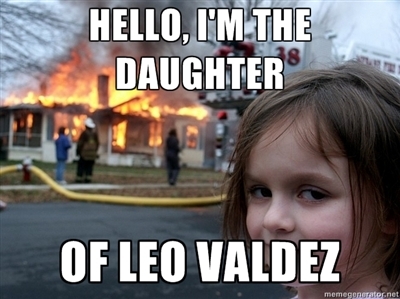 Leo's Daughter... (Meme). . Wallpaper and background images in the ang mga bayani ng olympus club tagged: the heroes of olympus the lost hero leo daughter fire funny fanart meme. This ang mga bayani ng olympus fan art might contain sign, poster, teksto, pisara, anime, comic book, manga, cartoon, portrait, headshot, and closeup.